Read the full text of the minutes of the Abingdon Union Board of Guardians 1835-6. Organised poor relief in Abingdon goes back to at least 1416 with the formation of "The Brethren of the Holy Cross in Saint Hellens Church" to care for the poor. Support for the poor by the church, organised charities, and wealthy individuals was by a variety of means such as the provision of almshouses, food, clothing, cheap coal, education and apprenticeships, and healthcare. Overall, personal and private charity was probably greater than that provided by public charity (Stewart, 1978). 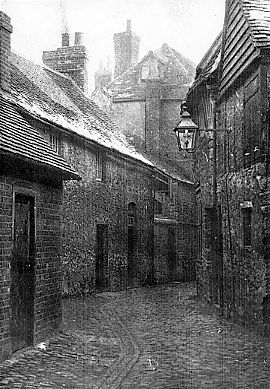 Possibly the earliest workhouse in Abingdon dates back to 1631 when the Mayor reported that "wee haue erected wthn our borough a workehouse to sett poore people to worke" (Leonard, 1900). Five years later, on 20th January 1636, Abingdon Borough records relate that 'it is this Daie Agreed that the House in the Abbie, now in the occupac'n of Will'm Kent, shall be purchased for the Boroughe, to make A workehouse if it maybe be'. There is a further reference to a workhouse in Abingdon in 1714 (Morrison, 1999). According to Cox (1999), in the June of 1724, following Knatchbull's Act of the previous year, St Helen's Parish Vestry were authorised to spend up to £150 on a house 'for the lodging, keeping, maintaining and employing such poor as do or shall desire relief.' In fact, the sum of £200 was spent on a property on the west side of Ottwell Lane—a narrow street running from Broad Street down to the Market Square along the line of what now remains of Queen Street. Queen Street (formerly Ottwell Lane) in the early 20th century. In its early years, the Ottwell Lane workhouse had a somewhat chequered history. The first governor appointed in 1725 at a salary of £30 per annum was the then parish clerk, Edward Hacker. He and his wife also received remuneration in the form of "meat, drink and washing". Their duties included the religious instruction of children. Their accounts were inspected by the parish overseers on the first Tuesday of each month. After only a year, the Hackers were succeeded by Widow Keats, then in 1728 Richard Coling became the third governor in almost as many years. With his appointment, a new system was introduced—Coling was "to have the benefit of all the labour of all the poor persons." For each inmate he received one shilling and sixpence "to find them in meat, drink, washing, apparel and an apothecary if necessary." Although money was tight—some were reluctant to pay the Poor Rate—Coling lasted three years in the post. By 1734, the overseers had to resort to advertising in the Gloucester, Reading and Northampton Mercury newspapers for "any person to manage and employ the poor—for the benefit of the parish.' A series of financial and staffing problems culminated in the appointment as governor of William Twynham, who proved unsatisfactory but almost impossible to get rid of. He eventually left in 1741. His successor died less than a year later. The other parish falling within the bounds of Abingdon, that of St Nicholas, also had a small workhouse although somewhat less is know about it. According to Stewart (1978), its operation was regularly "farmed out". 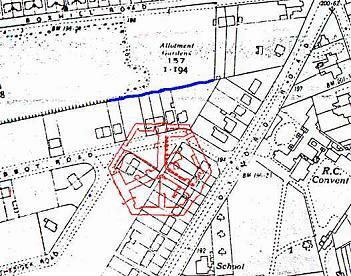 In 1799 a house in Abbey Lane was being rented for use as a workhouse. In 1777, a Parliamentary survey of poor-relief expenditure listed the St Helen's workhouse as having a capacity of 120 inmates, while that of St Nicholas could house 12. A further survey in 1804 reported that between 11th October 1802 and Easter 1803, the poor of St Helen's, both within and outside the workhouse, were farmed by William Middleton, a manufacturer of sackcloth. The parish paid him £700 and he also received the earnings of the poor. In St Nicholas parish, the poor were being farmed at 4s. per head per week. In the period covered by the survey, 40 paupers had been relieved in St Helen's parish, and 13 in St Nicholas. St Helen's Parish records indicate that its workhouse was generally home to about sixty people and that the work performed by the inmates included spinning, weaving and hemp-dressing. The workhouse also had its own brew-house. There are also references to the parish operating a factory and farm to which the workhouse presumably contributed labour. A flavour of life in the St Helen's workhouse comes from its the ledgers of workhouse expenses. An extract from 1833 is shown below. 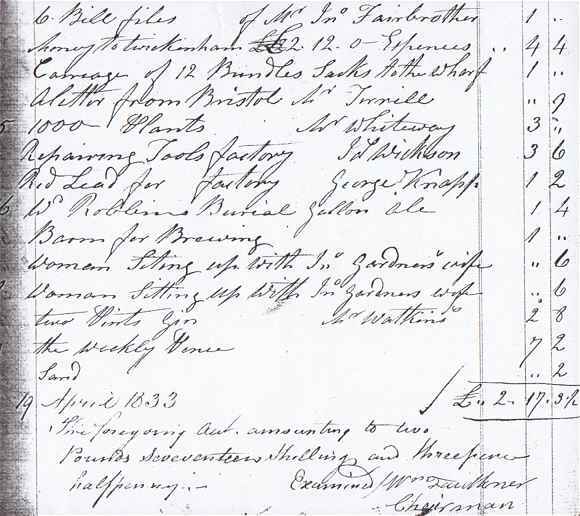 An inventory of the workhouse, taken in 1834, listed the building as containing a garret, chamber, closet, pantry, parlour, washhouse, brewhouse, bakehouse, men's ward, women's ward, attic, dead room, hall, potatoe warehouse, spinning shop, school room and factory. The factory's contents included 25 sacks, a shoemaker's sat, a taylor's goose, 9 looms, 13 spinning wheel, 31 footwheels and 3 winding wheels. In 1827, after more than a century in Ottwell Lane, plans were afoot to erect a new poor house for St Helen's. A vestry meeting on 3rd May 1827 resolved "that Plans and Estimates be taken of the Expense of Building a Comfortable Poorhouse in Lieu of the Present one..." Land for the new building came from one of the Vestry members, Mr Richard Badcock, who was to sell the parish half an acre for £50, and rent them another portion for ten shillings a year. In 1820, St Helen's was one of the many Berkshire parishes that had taken advantage of the Sturges Bourne Acts of 1818 and 1819 to establish a Select Vestry. Select Vestries, it was hoped, would exercise greater control over the administration over poor relief and included members voted for by the ratepayers given votes (up to six) in proportion to the value of their property. The Acts also provided for paid assistant overseers to be employed to assist in the administrative work of the Vestry — St Helen's did this is in January 1834 with the appointment of Mr Richard Ellis as permanent assistant overseer at a salary of £250. In 1827, the Select Vestry set up a special committee to consider the erection of a new workhouse. The committee discussed a number of schemes by which to finance a new building. These included a special five-shilling rate (calculated to amount to about £3,500) and an issue of twenty £65 shares to be redeemed one per year over the following twenty years. There was also a subscription list, to which the town council contributed £100, and which also benefited from a legacy, now amounting to £144-19-10 left in 1819 by Mr Samuel Cripps towards a new House of Industry. A local builder, Mr Thomas Winterborne, drew up detailed plans which were approved "except for the situation of the oven." A few weeks later, a meeting was held to finalise the contract, which included the stipulation that "the contractor agrees only to employ such persons as belong to the town." External walls to be built of Marcham stone and the inside cased with brickwork. The fourth course of bricks to be 9 inches; The thickness as follows, First Storey 2 ft 3 inches, Second Story 2 feet, Third Story 1 ft 8 inches, Fourth Story 1 ft 4 inches, the string courses shewn in the plan to be of Bath Stone. Stone sills to Doors and Windows in the Basement Story. The partitions to be of 4 inch brickwork with two ranges of Bond Timber 3 in by 2½ faced on one side and plastered on the other with one coat of Mortar. The Kitchen, Passage, Pantry and Cellar to be paved with common paving Bricks, the Coal Cellar and Areas to be pitched with Marcham Stone with Brick Gutters leading to Cess pool. A flue Oven to bake six Bushel, a Pump and Cistern, and Masons work hanging Coppers in the kitchen. The Area walls to be built with Marcham Stone with a freestone coping 1 foot above the surface. Two flights of steps from the Areas to be of York flag stone to lay on Brickwork and two Iron newels to the same. A flight of steps to each entrance of solid Forest stone with Iron newels, Hand rails and Balustrades, Iron Gates to the Front Entrance as shewn in the plans, and two Iron Gates in the Passages, the passages to be paved with York paving stone, Four Iron Columns in the Dining Room with The whole of the Ceilings to be lath'd with Fir Lath cast nails and plastered with two coats of Mortar. The Committee Room and room adjoining room to be fir with Two coats of Mortar, the Ceilings to be set with fine stuff and the walks stuccoed, and to be colour agreeable to the wish of the committee. Two plain Chimney pieces, the whole of the Inside walls and Ceilings to be whitewashed twice over, the Roof Covered with Countess Slates, the Hips and Ridges to be of Ridge Tiles, and the Chimney stacks to be of brickwork to the height shewn in the Plan. Oak Girders 12 in by 10 in, Joists 5 x 2½ framed in four bays at each end of the Building; Oak sleepers in the Committee room and Governor's room with sufficient bearings, and to be floored with ¾ Inch Yellow Deal, The floor joists 6½ In x 2½ In and covered with Inch yellow Deal. Door jambs 3 x 4½ from floor to Ceiling, the Roof, Plates 8 x 6. the Beams 10 x 8. principal rafters 9 x 4. at the bottom and 6 x 4 at the top; Purlins 6x5 with rafters 3½ x 2½ and 15 In from Middle to Middle and be close boarded, Five boards to be cut out of a 3 In plank. The building was to be completed within 11 moths of commencement for a sum of £2,255. Following further discussion about whether attic floorboards should be ¾ inch or 1 inch thick, and whether the first floor walls should be 2 feet 3 inches or 2 feet 6 inches thick, a final figure of £2,285-10-0 was agreed. No further entries are recorded in the committee's minute book. However, it appears that, for whatever reason, the proposed new poorhouse was never actually built. The vestry minutes of April and May 1834 indicate that virtually nothing had changed in the intervening seven years with the vestry as keen as ever to erect a new building. On April 19th St Helen's Vestry again voted on 'the expediency of immediately building a workhouse, commodiously arranged, for the classification of the paupers of that parish'. By coincidence this came just two days after the new Poor Law Amendment Act was introduced into parliament by the Chancellor of the Exchequer, Lord Althorp. On May 15th, it was reported that the had Vestry acquired a site for the new workhouse at Boxwell Piece, at the northern edge of the town. The local council had again contributed £100 towards the scheme. In fact, part of the land fell beyond the borough boundary and a special application had to be made to the King for permission to extend the boundary to include it. Meanwhile, the new Poor Law Amendment Act was making its way through parliament and passed into law in August, 1834. A new Poor Law Commission was set up to put the Act in practice throughout the country. In November, an Assistant Poor Law Commissioner (Edward Gulson) visited Abingdon to hold an inquiry with a view to the establishment of a Poor Law Union under the terms of the 1834 Act. Presumably he was welcomed with open arms by a town, or at least a Vestry, that had been champing at the bit to build a new workhouse for the previous six years. Berkshire: Abingdon St Helen (4), Abingdon St Nicholas, Appleford, Appleton and Eaton, Besselsleigh, Cumnor, Draycot Moor, Drayton, Frilford, Fyfield, Garford, Kingston Bagpuize, Lyford, Marcham, Milton, North Hinksey, Radley, Seacourt, South Hinksey, Steventon, Sunningwell, Sutton Courtenay, Sutton Wick, Tubney, Wootton, Wytham. Later Additions: Bagley Wood, Chandlings Ford. Oxfordshire: Binsey, Burcott, Chiselhampton, Clifton (Hampden), Culham, Drayton St. Leonard, Littlemoor, Marsh Baldon, Nuneham Courtenay, Sandford, Stadhampton, Toot Baldon. The population falling within the (enlarged) union at the 1831 census had been 16,654 — ranging from Seacourt (population 25) to Abingdon itself (total population 5259). The average annual poor-rate expenditure for the period 1832-35 had been £14,467 or 17s.4d. per head. The parish of Sutton Courtenay was the subject of a scathing report by Edward Gulson in the First Annual Annual Report of the Poor Law Commissioners in 1835. Its state of poor law administration was so bad that the other parishes in the Abingdon Union had originally rejected its joining. However, firm action by Gulson had remedied matters sufficiently that it joined the enlarged union in October 1835. 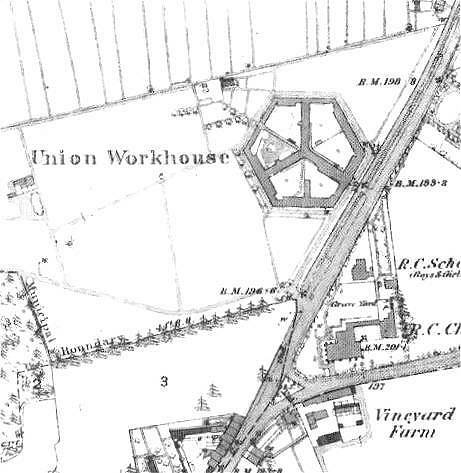 The new union workhouse was built in 1835 to a design by Sampson Kempthorne on the already earmarked 12-acre site Boxhill on the west side of the Oxford Road. It was designed to accommodate 500 people at a total cost of £9,000 (£600 for the land, £7,520 for building construction, £880 for furnishings and for architect and clerk of works fees) which was borrowed from the exchequer on a twenty year loan. The hexagonal layout of the building can be seen below on the 1875 map below. The 1:500 map (below) shows the layout of the main ground-floor areas. Kempthorne, whose father was a friend of Poor Law Commissioner George Nicholls, designed several of the model workhouse plans issued in the Commission's first two Annual reports. 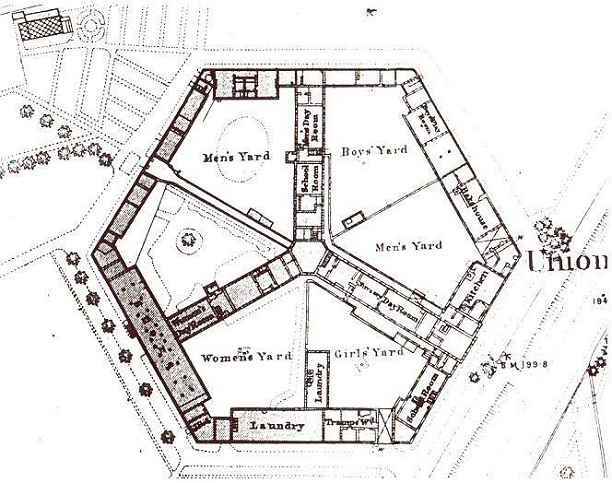 Abingdon was a slight (and unique) variation on his Y-shaped plan—it had four storeys, rather than the more common three. Construction commenced in March 1835 and was marred by the death on June 6th of a young labourer called Povey who had his skull fractured when a hammer was dropped on it. Work was completed in the late summer, and on November 14th, Jackson's Oxford Journal reported that the 58 pauper inmates of the old workhouse had been installed in the new union workhouse. 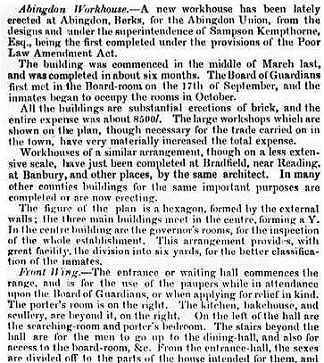 The new Abingdon workhouse was the subject of an article in the Companion to the British Almanac of 1836 (also reprinted in The Mirror of Feb 27th of that year). Not only did the new building benefit from a basic central heating system, but in its first year hot-water heating apparatus and gas-lighting were also fitted (gas lighting in the town had only commenced in 1834). A dramatic and major event occurred on the evening of Saturday 21st November when a shot was fired through the sitting-room window of the new workhouse governor Mr Richard Ellis (formerly the assistant parish overseer). This event, presumably carried out as a protest against the new regime, made the national press although what happened to those apprehended is not known. ...situated a ¼ mile NNE of the town is an extensive brick building, calculated to contain 380 paupers. Attached to the workhouse are ten acres of garden ground, cultivated by the boys and the elderly of the establishment. The able bodied are employed in spinning, weaving etc. Richard Ellis's wife, Ann, who was matron of the workhouse, died in post on 22nd June 1838. The following year, Richard married Hannah Baker. After Hannah died in February 1853, Richard resigned his mastership and was succeeded as master by his son, also named Richard. Richard Ellis junior had previously served as master at Farnham workhouse from around 1845-6, with his wife Susanna as matron. 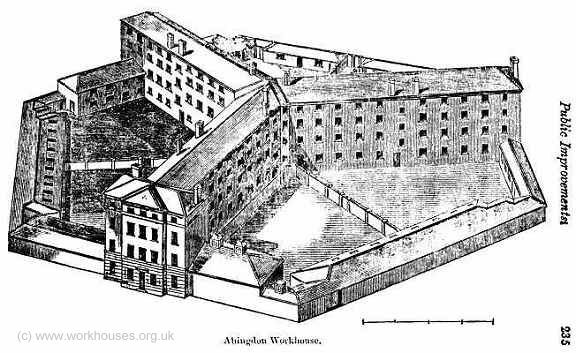 They left Abingdon workhouse in 1861 and moved to London. Richard Ellis senior died in 1863. The Board of Guradians' kept a prudent eye on the day-to-day expenditure of the supplies needed by the workhouse. These were regularly put out to competitive tender and advertised in local newspapers. Official communications from the Union were sealed with a special red wax into which was impressed the Union seal. 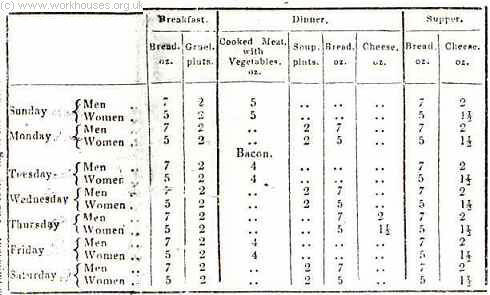 The diet fed to the workhouse inmates was based on dietary tables issued by the Poor Law Commission. The one used by Abingdon was considered of sufficient interest to be reproduced in the local newspapers at the time. Christmas cheer at the Workhouse — The Christmas dinner to the inmates of the Workhouse was given on Monday last, when the paupers were regaled with a substantial repast, to which ample justice was done. After dinner, the usual quantities of tobacco, snuff, etc. were distributed, and it is needless to add, the kindness of the Board, in thus thinking of the creature comforts of those under their control, was deeply and humbly appreciated. The annual entertainment given to the inmates of the workhouse took place on Thursday evening, when, in response to a private invitation, a good number of the master's and matron's friends were present, some of whom entertained the audience with amusing songs, readings, etc. Altogether, a very pleasant evening was spent. A large Christmas tree had been provided, and in the course of the evening, its glittering adornments were distributed amongst the juveniles, whilst the elder folk each had a present of some kind. Who shall guard the Guardians? — At the weekly meeting of the Abingdon Board of Guardians the master of the workhouse (Mr J. Clarke) reported: Admitted, 2; discharged, 4; dead, 1; in the house, 128; corresponding week last year, 143; vagrants relieved 8. A letter was read from Mr T. Rogers, Stert Street, in which he asked for settlement of a claim for £3, for a plate glass window which one of the workhouse boys had broken whilst returning from the national school. Meat, 7d per lb, Mr F. Legge, Ock Street; Cork butter, 1s 1½d per lb, fresh butter 1s 7d per lb, bacon 64s per cwt, rice 13s 6d per cwt, cheese 62s per cwt, salt, dip-candles, hearthstones, Flander's bricks, and soft soap, Messrs Dickey and Arnold, Ock Street; coals 15s 2d per ton, E. & J. Copleand, East St Helen Street; port wine 16s per gal, brandy 24s, gin 11s 6d, Messrs Ballard & Co, The Square. You understood me rightly that the produce of the ten acres of land adjacent to the Abingdon workhouse had enabled me, besides supplying vegetables for the use of the inmates, to credit the guardians with £100. The potatoe crop, although a failure in most places, has not been so to any great extent here. The soil being of a light description, and the system of planting in the autumn having been followed, conduced, in a great measure, to the preservation of this valuable crop. The quality of the potatoes was such that they were eagerly sought after, and realized an average price of 11s. 3d. per sack. By keeping, upon an average, twelve large pigs, which we purchase in a very poor condition, (spayed sows being preferred,) we can use all our spare offal from the garden, and this description of pigs will eat it, and get half fat upon it. We obtain a large quantity of manure from them, and, with a small purchase of stable dung, are enabled to manure the ground sufficiently. The liquid obtained from the washhouses, privies, &c., is all conveyed into close cesspools in the garden, from which it is pumped, and conveyed between the rows of the crops, particularly mangold wurtzel, by which means this plant attains a weight of from 20 to 25lbs. each, and sells at 20s. per ton. In winter the liquid manure is pumped up and distributed over such parts of the ground as are dug in, and the ground is trenched and prepared for spring crops. A gravel pit is kept always open for the employment of those who are not otherwise employed ; the gravel sold to surveyors and others produces more than sufficient to purchase manure and straw for the piggery. The seeds we grow ourselves, so that no extra charge is made upon that account in this return. In employing paupers in the garden, or on out-door work, one thing must be particularly attended to, that is, the character of the persons so employed. Unless upon particular occasions, I do not employ young able-bodied men, or even married men with families, if I can learn that they became inmates by their own misconduct. I make it a matter of favour to employ them there; and for those who do not work well while there, some sort of employment within the house is found. The old men and boys occasionally work in the garden, which makes them cheerful and keeps them in good health. The ground is worked by the spade and a light harrow, which is drawn by the boys. You will perceive by the return herewith sent, that the common charges are credited with £52 for vegetables consumed by the officers and paupers, which number, including children, on the average, about 200 weekly. There was a regular turnover of staff at the workhouse. Schoolmasters and schoolmistresses in particular did not usually stay long in post. Here are some job advertisements from the 1870s. THE Guardians of this Union will at their meeting, to be held on Monday, the 24th day of February next, proceed to the election of an unmarried Schoolmaster for their Union Workhouse, who must be duly qualified to perform all the duties required of him by the Local Government Board the Guardians. Salary £35 per annum, or such larger sum as may be awarded by the Committee of Council on Education, with board, lodgings, washing, &c.
Candidates, who must be members of the Established Church, and in possession of a certificate, must apply in their own handwriting, stating age, and what class of certificate they hold, with testimonials of recent date, not exceeding five in number, to be sent to me at my office, Abingdon, on or before February 15, and such candidates as are considered eligible will have notice to attend on the day of election. Preference will be given to those candidates who can play the harmonium. THE Guardians of this Union will at their meeting, on the 14th day of July next, proceed to the election of a person to fill the office of Female Industrial Trainer rd Laundress at the above Union. Candidates, whose age must be between 25 and 45 years of age, must be a single woman or widow without encumbrance, and will be required to superintend the able-bodied women, instruct the girls in washing rd ironing, and to assist the Matron in carrying out the orders of the Guardians generally. Salary £20 per annum, and the usual rations and apartments in the Workhouse. Applications, in the handwriting of the candidates, accompanied by testimonials as to character and fitness for the office, to be sent to me on or before the 5th of July next, and persons selected will have notice to attend on the day of election. GARDENER AND SUPERINTENDENT OF LABOUR. THE Guardians of this Union are desirous of receiving applications from single persons, or widowers without encumbrance, for the above office. He will be required to possess a practical knowledge of gardening, to superintend the male adult inmates, and to act as Industrial Trainer to the boys when at work in the garden. He will be further required to take charge of the boys, and preserve order in the playground after school hours, to superintend their rising, being properly washed and attired for morning prayer, &c., and to render general service. The salary will be £25 per annum, with board, washing, and furnished apartments in the workhouse. Applications, stating age, present or former employment, with testimonials of competency not exceeding three in number, of recent date, to be forwarded to me on or before Saturday, the 13th day of September. The appointment will be made subject to the approval of the Local Government Board. In around 1884, a small "iron" chapel dedicated to St Margaret was erected at the north-east of the workhouse. In 1888, the Boundary Commission proposed that all the Oxfordshire parishes in the Abingdon Union should be reallocated to the Adjacent Headington Union. The town council opposed this, apparently successfully, arguing that it would leave Abingdon with a workhouse that would then be too large for the size of the union. All in all, the workhouse—known locally as the "Grubber"—was a rough and depressing place. In its latter years, according to Thomas (1979), the female residents did the laundry, cooking and cleaning, while the men were put to gardening and chopping firewood; this was bundled and distributed on a hand-cart by an old man called Blind Charlie. Itinerant beggars, who were only allowed to stay one night, had to break up stones for road-making in return for their night's bed and board. 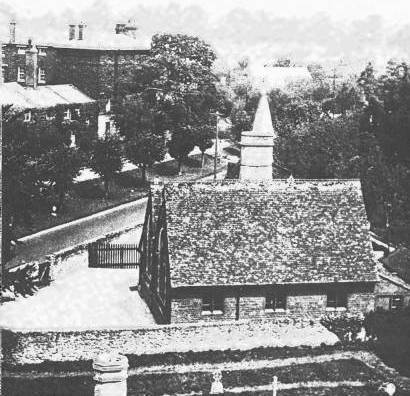 Abingdon Workhouse (left of picture) from SE, circa 1930. On Tuesday 1st December, 1931 the last meeting of the Abingdon and Wallingford Guardians Committee took place at the now "Abingdon Poor Law Institution" and the transfer of patients to Wallingford was arranged for the end of this month, from 28th December onwards. "I think, perhaps, one or two words are due, seeing that this probably is the last time we shall meet here as the Abingdon Guardians Committee. Those who, directly and indirectly, have been responsible for the care and comfort of the sick who have been nursed here, and all those who have found a refuge from want and trouble will feel the passing of this institution after their labours here and the void it creates. Those who are moved from here will find themselves in fresh surroundings, but, I am sure, we not only hope, but believe that they will find a welcome and understanding from those who will have the care of them." (Cries of hear, hear) "There is one thing I am certain we want to do, and that is to pay a tribute to the officers of this institution and thank them for their services. Some of them we hope will be able to continue with us." The inmates had a final Christmas dinner consisting of roast beef, roast pork, boiled potatoes and green vegetables, Christmas pudding, custard, beer and mineral water. On 1st Jan 1932, there were various presentations at a Staff Farewell Social. The Master, Mr JH Smith, presented a silver salver to Dr Woodford, Medical Officer for the previous 32 years. The Matron, Mrs Howard, presented a Westminster chimes striking clock to the Master, and a silver salver and hot water jug to Sister Hamblin. Songs were sung by Mrs Pickett, the Master, and the gardener, and the rest of the evening was given over to dancing, the proceedings terminating with the singing of Auld Lang's Syne . The workhouse was demolished in 1932 when the site was redeveloped by the Coventry firm of Oxdon Lands Ltd. who canvassed the Borough Council for new street names. Abbot Road was named after Sir Charles Abbot, 1st Baron Colchester and Speaker of the House of Commons 1802-1817, son of John Abbot, headmaster of Abingdon School 1753-58. Thesiger Road was named after Sir Frederick Thesiger, Conservative MP for Abingdon 1844-45 and 1847-52. The only visible reminder of the workhouse site is the boundary wall which separated the workhouse grounds from the allotment gardens (now a playing field) on the south side of Boxhill Road. In 1929, the Master of Abingdon workhouse approached a local school for a pupil to train as workhouse clerk. The boy selected was 14 year old Laurie Liddiard. You can listen to some recordings of his memories of his time at the workhouse. Berkshire Record Office, Berkshire Record Office, 9 Coley Avenue, Reading, Berks RG1 6AF. Holdings include: Admissions and discharges (1916-1930); Deaths (1866-94); Settlement papers (1883-1924); Guardians' minute books (1835-1930); Assessment Committee minutes 1862-1927; Provisions consumption accounts (1928-31); Farm accounts (1928-32); etc. St Helens Parish Office, Church Centre, St Helens Court, Abingdon OX14 5BS. St Margaret's chapel baptisms (1884-1932). Stewart, Patricia (1978) Poor Law Administration at Abingdon, Berkshire, Before 1834. M.Sc. Thesis, University of London. Thanks in compiling this page to Jacquie Smith at Abingdon Council Archives, Ann Smithson at St Helen's parish office, and Brian Ellis.